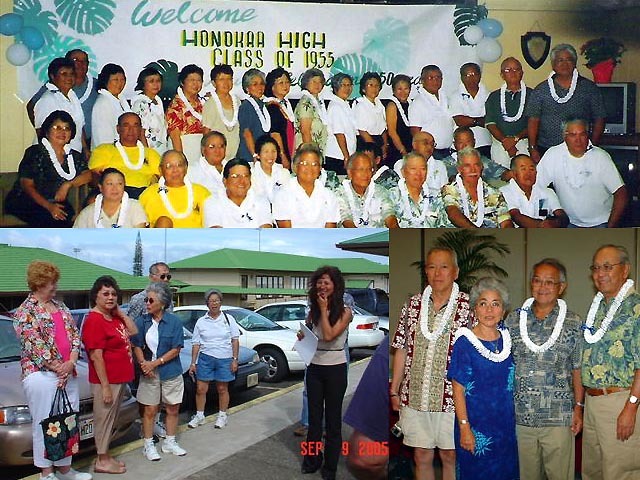 The Honokaa High School Class of 55' reunion was held on September 9 and 10, 2005 in Honokaa. On Friday night, Sep 9, after touring Honokaa School and donating $3000 to the school, we met at the golf course club house. We had decorated the place that morning and it looked rather nice. We had a class pictures taken. Not all Classmates attended the Friday soiree as they had planned to celebrate the following night in Kona. As part of the program, each classmate introduced themselves and gave a short talk about what they did the past 50 years. Very interesting stories. The Saturday night activities were held in the King Kam IV in Kona. We had our dinner and talked story most of the night. Select the links below to visit our photo gallery pages.